Sophie is a beautiful girl with a great history of Champions in her pedigree. Sophie has a pale gold coat , non-fading dark pigment, a gentle face; solid, well-balanced structure and elegant, effortless movement. She is a very sweet and gentle girl with an easy-going, true golden temperment. She is quick to learn and very eager to please. Of all our goldens, Sophie stands out as definitely being the most patient one. She waits for the others to drink first, get their hugs first, and just about anything else first - she is never demanding and always polite. Although she never backs down from a new adventure or a chance to play with the other goldies - she is very loyal and prefers human companionship above all else. Although she loves the water and loves to retrieve, she is just as content to lay at your feet and just be close. We would like to thank Szuszanna David at Shining Gold Kennel in Hungary for allowing us to make a home for such a delightful girl. With the wisdom of her father and the beauty of her mother - we know that Sophie will carry on the tradition of greatness that her lineage bestows. 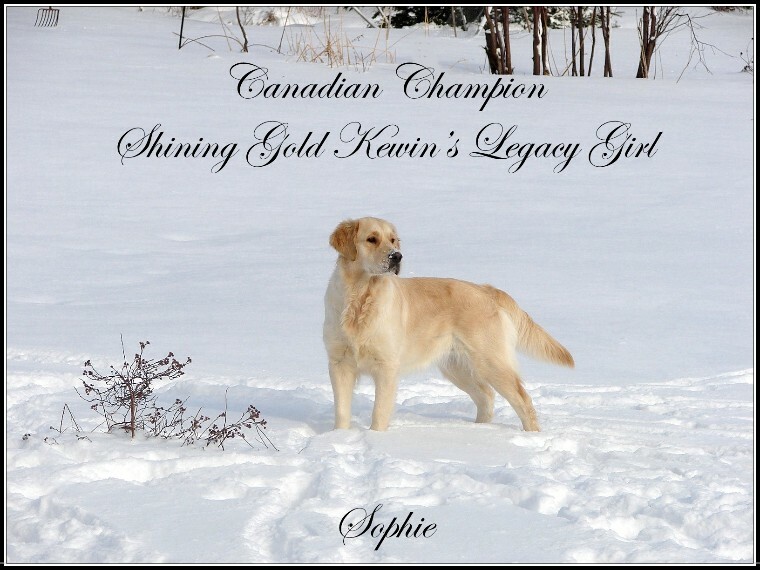 On November 16th, 2008 Sophie became CANADIAN CHAMPION after an extremely successful autumn season of showing and placing at various kennel clubs throughout Southern Ontario. Sophie attained her points very quickly and was crowned champion at only 13 months of age !! Thank-you Rebecca Mcauley for handling Sophie to such a brilliant finish. PLEASE CLICK ON ANY OF THE IMAGES for a much better view. Beautiful Sophie at 10 weeks. Sophie as a pup catching up on beauty rest. Sophie in the snow at 5 months.